Poinsettia are a symbol of the holidays and ubiquitous in stores, office building lobbies, banks and other public spaces between Thanksgiving and New Year's Day. Ever wonder about the history of this popular plant? How did this Central and South American native plant turn into a symbol of Christmas? What are the legends surrounding this holiday plant? And, more importantly, if you were given one as a gift or purchased one to decorate your home, how do you care for it as a house plant? Poinsettias hail from Central and South America, but they can only grow at lower altitudes. It is said that Montezuma, the last king of the Aztecs, had caravans of poinsettia brought into Mexico City because the plants wouldnít grow close to the city itself. The Aztecs used the sap of the plant as well as the bracts, the colorful leaves most people incorrectly call poinsettia flowers, to make a red dye for clothing. Europeans first noted the plant in the 16th century. 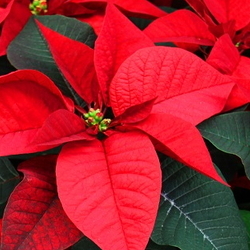 Poinsettia's botanical name, Euphorbia pulcherrima, means "very beautiful." It was given to the plant by the German botanist Wilenow, who was dazzled by the red bracts when a stray plant grew in his greenhouse. The poinsettia itself takes its common name from Joel Roberts Poinsett, the first United States Ambassador to Mexico. Poinsett loved botany, and on one of his excursions through Mexico he was much taken with a red shrub growing near the side of a country road. As luck would have it, William Prescott, a horticulturist with a passion for history, was looking for a new name for the plant. He wanted a common name that people would associate solely with the red Mexican native plant. Prescott decided to name the plant after Joel Poinsett, and the rest is history. The poinsettia wasn't associated with Christmas in America until an enterprising California family, the Eckes, grew the plants in greenhouses for sale in the early 1900s. Today, the Eckes continue to be the primary source of poinsettia in the nation. Although wild poinsettia shrubs in Mexico can grow to heights exceeding 10 feet, most poinsettias grown for holiday use are kept as small house plants. Theyíre available in red, white, pink and close to 100 varieties today including speckled and marbled colors. 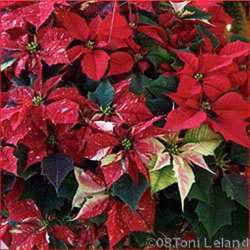 When examining poinsettia for sale in your local nursery, look for healthy leaves. The leaves should be dark green. Any yellowed or dropping leaves indicate that the plant has been stressed, possibly by rapidly changing temperatures such as placement near a door or drafty window. Such plants should be avoided. The flower's bracts or specialized leaf parts are what give the plant its colors. The flowers are actually the tiny yellow points inside the bracts. Look for bracts in proportion to the leaves; large, well formed, and colorful. One of the most important things to do to keep your poinsettia healthy and happy is to transport it home from the store with great care. Poinsettia hate cold weather, and exposure to wintertime chills, even for a short period of time, can damage the leaves and bracts. A good local nursery will take care to wrap your poinsettia against the cold weather, but big box stores may not be as careful. Ask for extra bags and wrap the plant against the cold. Take it directly to your car, and keep it warm until you get home. Place your poinsettia in a sunny window or at least near a good source of light. It is, after all, a living plant that needs a source of sunshine for photosynthesis. 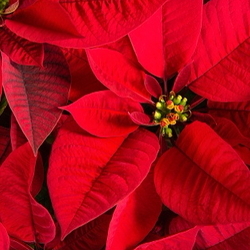 Because poinsettias are actually tropical plants, make sure the daytime temperatures never fall below 60-70 degrees F. Make sure that the leaves or bracts arenít touching a cold window pane, and keep them well away from doors, where the drafts from opening and closing outer doors can chill them and deform the bracts. Water when the soil feels dry to the touch. Excess water turns the leaves yellow; too little water, and the leaves fall off. Some pots are covered with heavy foil for the holidays. You may want to pull the foil away a little from the plant to make sure that the water is draining away from the base of the container. Technically it's not flowering again, just producing colorful bracts, but for the sake of simplicity letís say you want your poinsettia red again next Christmas; you want it to "flower." Keep your poinsettia in full sun and in a warm place. By February or March, youíll need to cut the plant back. Leave at least one to three leaves per stem. Fertilize with a balanced liquid house plant fertilize every two weeks during the growing phase. During the hot summer months, take your poinsettia plant outside, pot and all, and sink the pot into the garden soil. By early September, take the plant back inside. Now comes the hard part. You'll have to give your plant exactly the right amount of total darkness every night from mid-September to early December. From 5 p.m. each night to 8 a.m. each morning, place the plant in a closet in pitch darkness. Then, remove it and place it back in the sunlight. Continue watering and fertilizing as normal. The bracts should turn colorful again by early December, just in time for the holidays. If you want to celebrate the poinsettia, December 12th is the official Poinsettia Day. It honors the date of death for Joel Poinsett, a fitting day indeed to remember the shrub and the man so taken with the showy plant.